Is there anything better than a newly completed sweater? You might disagree, but it’s gotten cold here in NC, so I’m thinking no. Back in October I took the boys to SAFF with my mom (Pasha’s third visit, Vanya’s first). I knew we wouldn’t have much time to browse so I went in with one goal in mind — to buy the yarn for a Comfort Fade Cardi from Deep Dyed Yarns. Luckily we were the only people in her booth when we got there, so the lovely proprietress helped me pick out exactly what I was looking for. I probably could have gotten away with knitting the medium instead of a large, but I like how cozy it is. Seriously, I’ve worn this sweater every day since it finished blocking. The yarn is a superwash base, so it did have a lot of extra drape when I blocked it. Luckily I noticed before it dried completely and popped it in the dryer for about ten minutes. Presto chango! it’s perfect! The logistics — I used one skein of color A, two of B, two of C, and two of D. I have an extra skein of C, which I’m already trawling for a use for. I knit the boys DK weight sweaters for winter so I might try to find something that uses their leftovers as well. It feels good to have my first FO of 2019 in the books and have it be something that I bought and knit within short order. Now to tackle the rest of the stash (or maybe order another sweater)! or at least one that's not socks. Last week I was cleaning out some nooks and crannies around the house and I stumbled across a project bag with a fully completed shawl inside. I cannot for the life of me remember when I finished my Half Moon Oracle but I feel pretty confident it was right before Vanya was born. All it needed was the ends woven in and a good blocking. That's it! It was like I left myself a little surprise hiding out in my bedroom. I love the way this shawl turned out so much. I'll be 100% honest, when I added in the Spun Right Round I was suddenly certain I'd made a huge mistake but at the same time I was not interested in ripping back so I just decided to press on and see where things ended up. The end result is so springy and happy that I cannot believe I almost changed it. The only thing holding me back from knitting another is the monstrous stitch count at the end. I already have one giant shawl on the needles so I think I need to wait until I finish. At the same time, I love shawls over my tshirts and tank tops when I'm outside playing with the boys, so maybe I'll put one together to cast on next. at my sister's baby shower. I cannot tell you how excited I am that my boys will have a cousin their age and that my sister and I will be doing this mom of boys thing together. Of course it isn't a baby shower without a cute handmade gift. Months and months ago Eva asked me if I would be willing to make her son's going home outfit. I said yes, of course, and then immediately started freaking out. Do you know how much pressure that is? At the same time I was honored and completely psyched that she trusted me with it. And then I put it off for way way too long. Luckily baby knitting/sewing can be pretty quick. The Wee Short Notice turned out so sweet that I'm desperate to make one for Vanya. The directions are very clear and the whole knitted outfit, sweater and socks, only took one skein of Knit Picks stroll. This is the second time I've sewn a Harem Romper (Brindille and Twig), and it went much more smoothly this time. The whole construction is very straightforward and now that I have the idea down I'll probably sew up some more. As I was finishing the sewing (the day before the shower) my sewing machine jammed on the last seam. Ugh! I think I have the whole thing sorted now but I had to fudge a little bit and made her promise to let me fix it after the baby wears it home. Maybe this is a sign that I need to bite the bullet and get a serger? I'm so excited for babies and I cannot wait to get started on some more kid projects. After all, I've got three boys to outfit now! but the weather here has taken a turn back to the OMGIMSOCOLD, so they are coming in handy once again (seriously, it's supposed to snow again this week. I live in North Carolina and we've already had 80 degree weather this month. It's getting insane). Right before Vanya was born I finished up two more projects using yarn from SAFF 2017. I never made it an official goal to knit all of my SAFF yarn before the 2018 festival, but I think that's going to be a thing now. I never thought I was a poncho girl. It just wasn't something I gravitated towards, but then this piece came across my radar back when I was doing pattern roundups (I promise those will be a thing again once we get a little more settled in our new family life). In her pattern description Casapinka writes about how it's really a pullover shawl, not a poncho, and I can totally relate. The motivation behind knitting this was to wear as a nursing cover while out and about with Vanya, but he's a very active nurser, so it hasn't gotten a lot of wear yet. I love the way these colors came together. I did not notice until I started winding the yarn that I basically picked more saturated shades of the yarn used in the pattern. Oops! The A Hundred Ravens yarn was so much fun to work with and held color really well. I will definitely be hitting them up again next festival. The other FO is one of my impulse purchases. I had never heard of Deep Dyed Yarn, but her Good Juju line intrigued me and the colors in her booth were stunning. I only got this one skein (actually it was a birthday present from mom), but I immediately wound it and cast on the next day. This has been my most worn hat during this weird bit of winter. The yarn is nice and warm, but because it is sock weight it is not too heavy on my head. The pompom is from FFFabuknits, who has become my go-to source for all things pompom. Ok, now that I've talked all about how much I love these winter FOs it's going to be more spring-like, right? it's sock city over here. Pair #2 is the only complete pair of adult socks that I finished during the Ravellenics. And they are also not for me. This pair is for my mom (sorry to spoil the surprise, Mom). You might remember that she dropped some heavy-handed hints a few months ago that she would like more socks, so this is the second pair of "just because" socks I have knit for her. I loved knitting this pattern so much that I've started a second pair for myself, and I think I'll knit them just as tall. 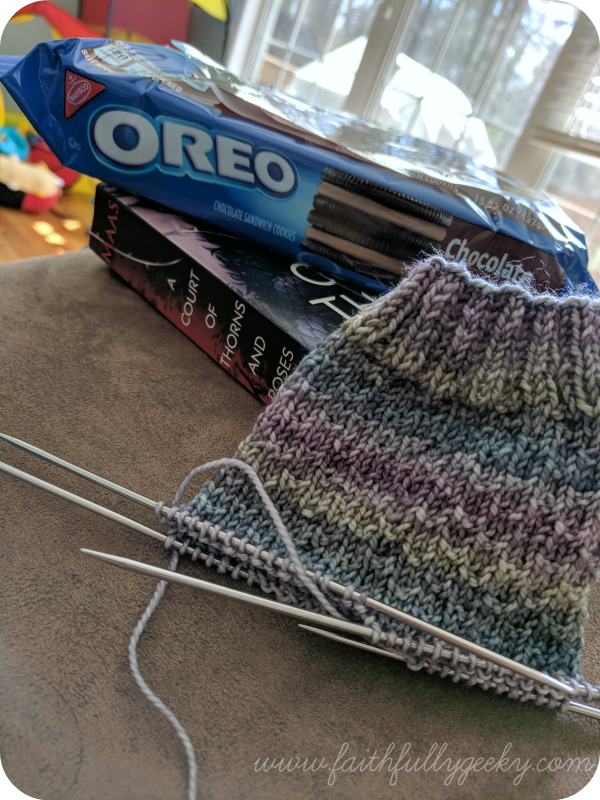 Usually by now I'm looking to knit shorties for the next six months or so, but it's still freezing here, meaning tall socks are a must. 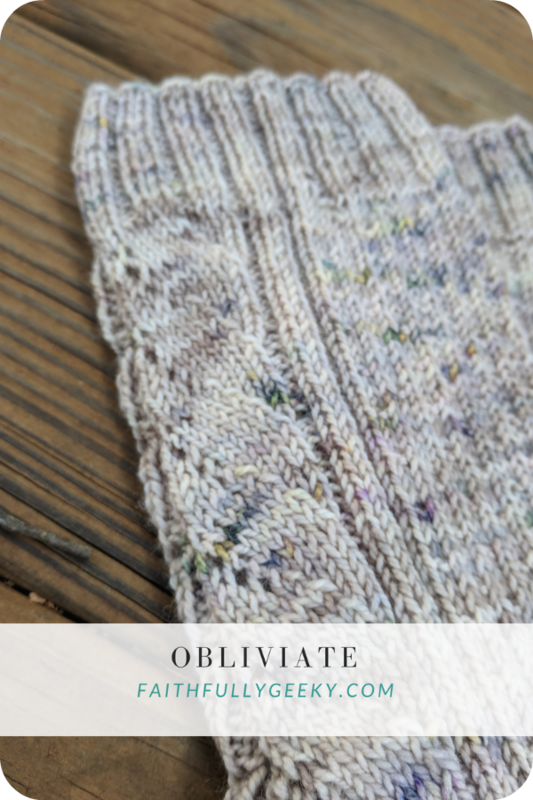 Not only was this pattern a joy to knit, but the yarn is a dream. I love my super soft socks for sure, but I have really been drawn to the more hearty BFL/nylon blends. There's something about the textured feel on my needles that I really enjoy. Mom also wears her handknit socks with birkenstocks (as those who live in and around Ashville are wont to do -- never change, Mom! ), so I feel like the extra toothiness of a BFL makes them a little more hardwearing than they would be otherwise. And yes, it is not lost on me that this is the second pair of socks I have knit for her that is Hermoine-themed. No, it's not intentional, but it is highly amusing.